Home » All Articles » The First Referendum, pt. 2: A video tour Kelli Stargel’s contempt for the people of public education. Come see. The First Referendum, pt. 2: A video tour Kelli Stargel’s contempt for the people of public education. Come see. Posted by Billy Townsend on Oct 5, 2018 in All Articles, columns | Comments Off on The First Referendum, pt. 2: A video tour Kelli Stargel’s contempt for the people of public education. Come see. I’m really not. I’m telling you the graveyard dead truth, as Grady Judd might say. I respect you, and myself, way too much to lie to you. 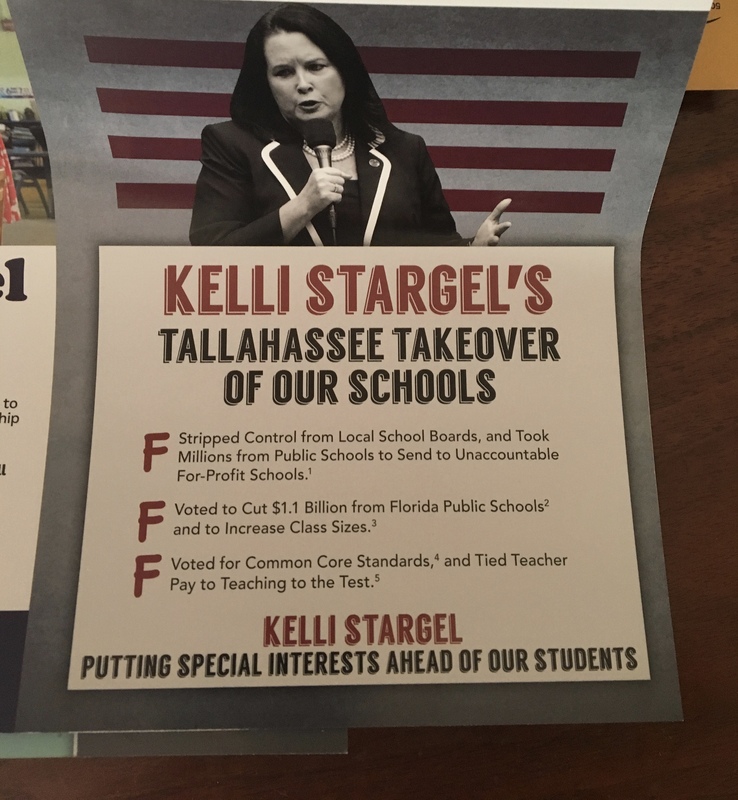 Bob Doyel’s new mailer is completely accurate, right down to the part about Kelli’s support for Common Core, in both its specific meaning and wider use as a synonym for “test and punish education. Click to enlarge. See this article providing the receipts on Kelli’s VAM and Common Core record — and her general acceptance of bad Democratic education ideas long ago discredited. And you’ve seen her record in draining $160 million since 2014 from kids and teachers and bus drivers. But as powerfully damning as Kelli’s record looks when it’s written down, it can’t compare to viscerally feeling the contempt that she and your state government have for you if you have anything to do with traditional public schools or the teaching profession. Nothing conveys that like video. So for the rest of this installment, we’re just going to tour some greatest hits from this generation of hateful, spiteful attitudes toward the human beings of education. Stargel and Rick Scott’s Education Commissioner Pam Stewart are the stars. But Ron DeSantis has been very clear that he plans to continue on this path. It’s just a fact. Expect much more of this if he’s elected. See this article. 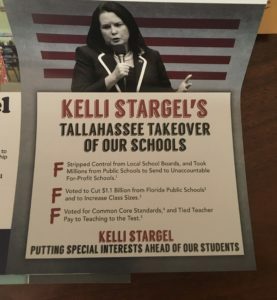 Trust me, if you have anything to do with public schools, you won’t get a pass for being a Republican if Stargel and DeSantis win. This fist clip comes from a few months back, when I asked Stargel if she would attend a Polk School Board meeting this past spring. In that meeting, we had to address her mandate to close, destroy, or turnover to private hands several of our schools because of their fraudulent school grades. I came to call this list of schools “the Kelli Stargel school kill list.” Full background and discussion here. “I do not plan to be there,” Stargel said. “You do not plan to attend, to stand by your own laws?” I asked. It was literally a matter of her laws. And she did not show up. She never does. By now this video is infamous for Florida education stakeholders. But it still gets better — or worse — every time I watch it. Bottom line, Pam Stewart has been dodging questions for a year about rigged teacher tests that are helping drive the teacher shortage. Reporter Katie LaGrone finally corners her. What happens next is one of the most spectacular fits thrown by a so-called leader I’ve ever seen. Stewart issues multiple angry complaints about LaGrone interrupting her lunch. I’ve know many 8-year-olds with greater poise and self-possession. I think my favorite part is how triumphant Stewart feels about getting LaGrone to say “I’m interrupting your lunch.” It’s a beautiful display of the utter cluelessness of unaccountable power. Watch the whole thing — or fast forward to the end if you want to see Stewart do her thing. If Pam Stewart, Florida’s top education official, has apologized to the public or even addressed her behavior in any way, I haven’t seen it. Shows you what kind of person she is. And this is very typical behavior for the entire Board of Education/Department of Education apparatus. Consider how Florida Board of Education member Gary Chartrand treated then interim Polk Superintendent Jackie Byrd at a summer 2016 BoE meeting. At the time, the BoE was gutting multiple Polk middle schools with forced teacher transfers based on this test-score equation, known as VAM. Kelli Stargel was the key Legislative champion of VAM. VAM has since been dropped by the Legislature as a mandatory thing because it was discredited way back in 2012 or so by everybody else in the country. Florida is always a late comer to terrible ideas. But it still lingers in teachers’ record of performance, which is costing them money and discouraging them from working in challenging environments today. Chartrand, in 2016, thought all of this was “fun.” Really. Listen to him say on a hot mike. I was a School Board candidate at the time, and someone brought this “fun” video to my attention. I publicized it; and state behavior toward Jackie Byrd eventually improved, although the human and policy damage was already done. A few weeks later in 2016, I took a vacation day from my job to attend the BoE meeting in Tampa. I asked Gary Chartrand face-to-face what he considered “fun” about all this. He hemmed and hawed and then half-shouted “Give me a break” and walked off. I had attended the BoE meeting because my son’s school was literally on the agenda. It was in the next batch of Polk “turnaround” schools. It was on the future hit list if it didn’t “improve” from D-to-C. I signed up to speak so I could tell the BoE about actual human impact of their actions — and that I did not want that done to my son’s school. I went there to insist that they respect my choice — and the choices made by the parents of my son’s schoolmates. An hour or so before I was supposed to speak, the BoE took my son’s school off the agenda. And here’s what happened when I went to speak. Note the condescension. And the bouncer. And the contempt for my choice. One hears often about the opinions of “high skill, high wage” parents concerning public education in Polk County — and elsewhere. Economic developers talk about it all the time. Well, I am a high-skill, high-wage parent; and the BoE still had nothing but contempt for me. Trust me, you’re not special enough for them to care about you, if you choose a traditional neighborhood school. Finally, let’s wrap this up with a visceral view of the human consequences for children of this behavior. Here’s the background: like 2016, Polk was ordered in 2017 by some detached bureaucrat in Tallahassee to forcibly transfer several dozen teachers from about a dozen schools — after the 2017-18 school year started — because of their VAM score. Our district leaders obeyed — without really consulting the School Board. I think we should have considered saying no and facing the consequences. But I didn’t raise enough hell about it to be effective. That’s my fault. And so these young women came to our School Board meeting to tell us about the human effects of our state government’s thuggery and our local decision not to stand up against it. Behold the human consequences of the behavior you see in these first videos. Behold Kelli Stargel’s record on human display. I’ve already talked about the Democratic shortcomings on education here in Florida. It’s mostly an inability to focus rhetorical and policy fire on the most crucial service — and vulnerability — of the people who run Florida state government. It’s mostly a reflection, I think, of weakness born of many years out of power. But the adults wielding that power disgustingly in these preceding videos are all Republicans. 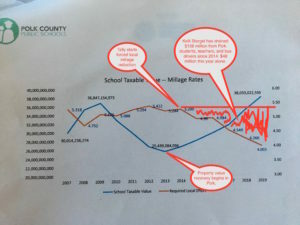 They are all inflicting harm on the voters and people and education stakeholders of Polk County, which is reputedly a red county. This is what you voted for, folks. Are you happy with it? If not, you have a tough choice, Republicans. I can’t make it for you. I won’t tell you what to do. I can only show you the real consequences. And understand this: these people aren’t going to become better people. That’s why this year’s imperfect referendum on the Florida Model is the first of many to come. Because as long as this is the reality we face, we believers in public education and teachers have no choice, no matter our party or point-of-view. This inhumane, morally and intellectually corrupt model, can’t be saved. It must be beaten and rebuilt because it rests on rotten human intent. Our first referendum on the hateful Florida model, part 1: Ron DeSantis is the Florida educational establishment. Just look at his supporters. The first referendum on Florida’s hateful model, part 2: What would Sheriff Judd do?